Scott Campbell, an 8-year veteran of the Missouri Department of Transportation, was hit by a distracted driver in a pickup truck while on the job in April 2014. As Wednesday’s rush hour dies down on Interstate 70, Scott Campbell is merging onto the highway. “Off like a herd of turtles,” he says. Campbell is with Missouri’s Department of Transportation and he’s spending the night here with the maintenance team to repaint the yellow stripe in the fast lane. The caravan of trucks, with mounted signs, flashing arrows and bright lights, spreads out for more than a mile creeping along at 10 miles per hour. Even all these emblazoned alerts didn’t protect Campbell when was struck by a pickup on the job two weeks ago. Fortunately, both Campbell and the driver walked away from that accident. In just the past five years, just in the State of Missouri, 53 people have been killed, and almost 3,000 injured in road work zones. Now Missouri officials are looking at deploying harder-to-ignore methods to get drivers to slow down. State maintenance engineer Beth Wright says these accidents are becoming far too common. Wright says she’s seen preoccupied drivers eating, putting on make-up, reading the newspaper and texting. Indeed, Missouri has some on the most relaxed phone use and driving laws in the country. So, because it appears flashing lights and signs aren’t enough, Missouri is trying out a new, very loud approach. The state borrowed a Long Range Acoustic Device, or LRAD, which is essentially a massive speaker used as a communication tool by the Navy. They’ve also been used to keep wildlife away from airport runways, break up rowdy protests and deter pirates. They look like a flattened searchlight with a speaker screen. You can tilt it, swivel it, adjust its volume and play basically anything an mp3 player can handle. 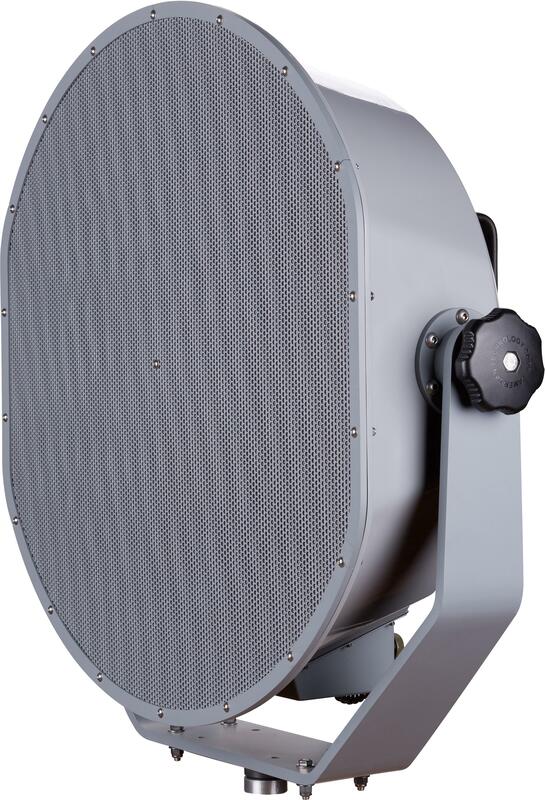 The LRAD pumps out a concentrated beam of sound in a 15 to 30 degree cone for distances up to up to 7 miles. University of Missouri engineering professor Carlos Sun and research engineer Henry Brown tested these sonic signals at volume levels in line with federal occupational safety standards. First, they tried it in a parking lot. Then they moved it to the highway – strapped to the back of a slow moving truck with arrows and lights. The LRAD cycled between a male voice saying “Slow vehicles ahead” and a brief spurt of staccato notes that sound similar to a burglar alarm. If you’re standing outside of your car 600 feet away from the unit, the sound rings at 78 decibels. That’s about as loud as a garbage disposal. Sun says what makes the LRAD more noticeable is its higher frequency. “We found that there was statistically a significant difference between the drivers who heard the warning and those who did not,” Sun says. The drivers exposed to the audible alert slowed down and merged out of the closed lane sooner, according to Sun. 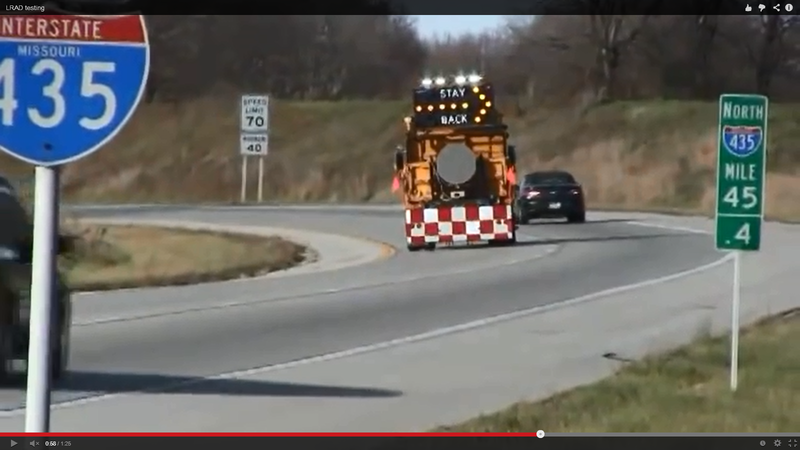 A screen shot of an LRAD (attached to the back of a moving MoDOT truck) being tested near Kansas City. But when the department posted a video of the LRAD in action, social media reverberated with outrage and fear. Commenters flooded the video suggesting the government was overstepping its bound and called into question the safety of such a system. Brian Harvey is with the LRAD Corporation which lent the device to Missouri for testing. “We saw the blow up of social media and we we're somewhat flummoxed because we knew what the test was for and the reason for the testing,” he says. Harvey says the biggest misconception about LRADs is that they are a sonic weapon. That’s large in part to their reputation of breaking up Occupy Movement protests. The devices have also become more prevalent in safety scenarios. Japan is using a new model as a tsunami warning system. And the U.S. National Guard recently mounted LRADs to its helicopters during the Colorado floods and Washington mudslide to communicate with people on the ground. As for road use, Carlos Sun says the alerts gradually increase in volume as drivers approach and dissipate once passed. And because the device produces only a narrow beam of sound, experts say nearby neighborhoods shouldn’t be bothered. Even so, Missouri has decided to postpone any trial runs for another year until officials can do more education and research. Back in the truck with Scott Campbell, a few cars have drifted in and out of the closed lane, but it’s otherwise been a safe night. While plans for the LRAD are on hold, Campbell says the maintenance team has become even more cautious of cars. He hopes drivers will keep their eyes on the road – not their phone – so they can be able to see the flashing yellow lights.